in 2015 Surefire released one of the coolest EDC/ Utility flashlights to date. The Sidekick A. 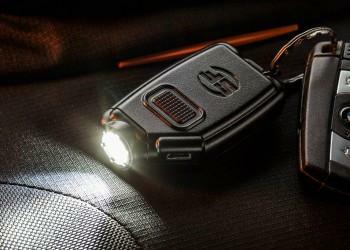 This little light is about the size of your car keys remote and is capable of putting out 300 lumens of bright white light! The even better part is it uses a micro USB charging port so you can literally charge it anywhere using a wall or outlet charger or even your laptop. It boasts a run time of 1.25 hours on the maximum setting and up to 45 hours on the lowest. The light has 3 different switching modes. Low (5 lumens), Medium (60 lumens) and High (300 lumens). It comes from the factory with the first output being low, then switching to medium and then high with each press of the button. If you want to reverse the order and have the first output be #AllTheLumens then this procedure will walk you through the process. Step 1. Plug the light into a power source with the provided cable. -The LED should come on briefly and then shuts off before it starts blinking. Step 3. Turn it off and then unplug it from the power source. Your lights output order should now be the opposite of what it was. To change it back, simply repeat the process. Once the unit no longer charges, can you replace the battery on the sidekick? My sidekick won’t turn on when it is unplugged from charging cable/usb port. Switch works properly when plugged into USB port but will not turn on when unplugged, (only two mos old). any suggestions? regarding step two of changing the switching order, pressing the button three times turns it on then changes the output twice. I can not get the order changed.